Nothing elevates a gathering more than an elegantly presented cheese board. Tailor-made for mingling and conversation, a delicious assortment of cheeses, paired with just the right foods, provides a feast for the eyes as well as the palate. A cheese board is a guaranteed crowd pleaser - it sparks conversation and allows your guests to explore new taste and combinations. 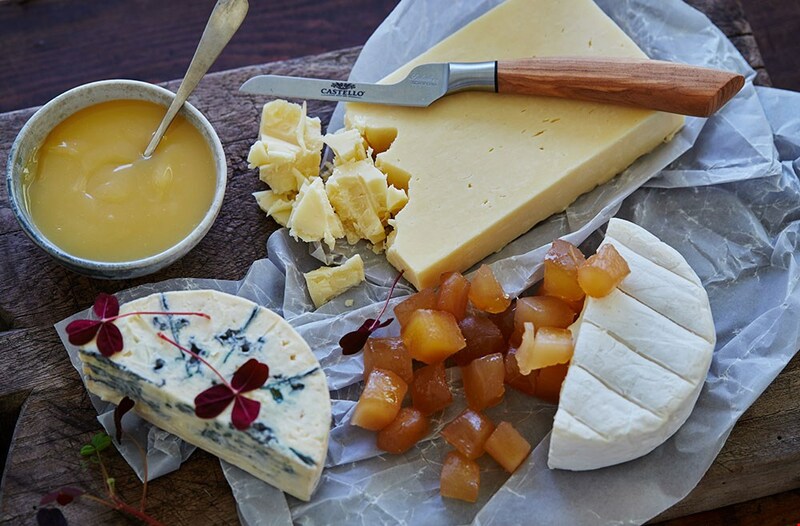 Think of color, shape and texture when selecting cheeses for a cheese board. It’s a good idea to serve at least 3-5 different cheeses and choose cheese from each type of cheese – for this board we chose a Creamy White, Creamy Blue and Castello Matured Cheddar cheese. Always remember to have a mild cheese in your selection in case your guests are not as adventurous as you! To accompany the cheese we’re adding lemon curd and pickled ginger. Normally, lemon curd is served with pastries or toast, but don’t underestimate the effect of pairing it with cheese where it provides both freshness and sweetness. If you’re making the lemon curd yourself, you can also replace lemon juice with mashed raspberries or other citrus fruits. On this board we also serve pickled ginger, which in many ways brings similar taste of sweetness and freshness. To get the full taste experience of the mold cheeses, we recommend taking them out of the fridge an hour before serving.